I love Halloween! I love all holiday’s, but my favorites are Christmas and Halloween! 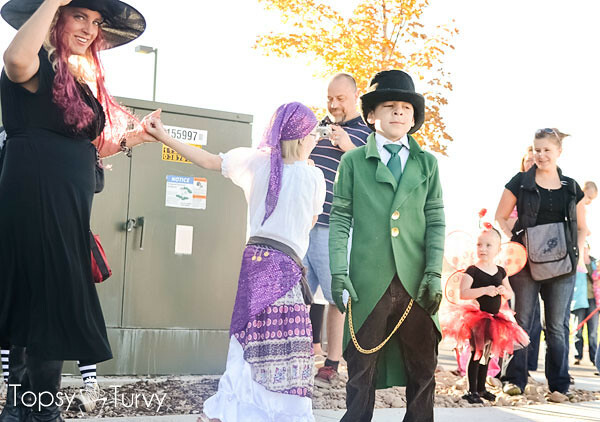 Last year we did the grab bag costumes since I had just given birth to Baby Boy, but THIS year I wanted to go back to our Family costume themes! 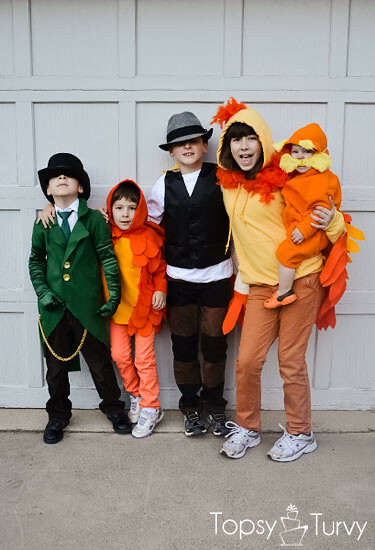 We actually went through a few different costume themes before settling on The Lorax!!! It was perfect cause we found something for EVERYONE to be that they were all happy with! All the other themes one of the kids wasn’t happy! Do you have any idea how hard it is to find a theme that 7 people agree on? in the end Bill and I ended up not doing costumes but I am SO happy with how the kids turned out. The Baby was an easy choice. The Lorax!!! I found an orange bathrobe and bought a size 18 months! I added a zipper down the center and used my serger to thin out the sleeves, sides and create short legs! The bathrobe was a tad bit shorter than I’d like the outfit, BUT I figured it’s be a snowy cold winter and he’d be in boots (jokes on me!). I bought white fur (they didn’t have yellow) dyed it with a polyester specific dye. I cut out the eyebrows and mustache in felt first – a few versions- and when I was happy with the shape cut out the fur. I sewed the eyebrows onto the hoodie, and the mustache onto elastic. 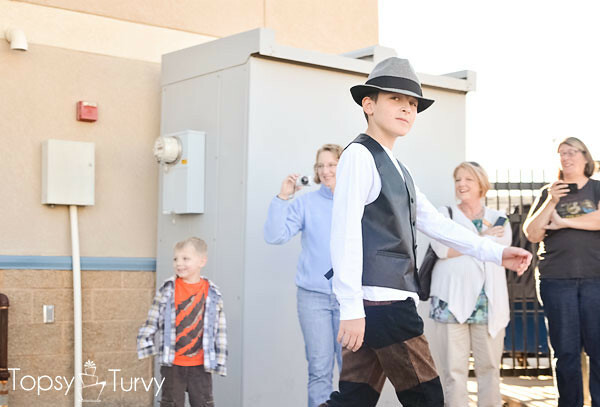 Computer boy was the most excited about his costume! The GREEN Onesler… He kept repeating that part, it had to be the one who sang the “how bad can it be” song! We already had the white shirt and black cords. I bought adult green gloves and boys green tie. I made the jacket adding green to a top hat we already had, and added the gold buttons and chains! It was so so SO much fun to make, esp with his total excitement as I worked on it! He kept posing (left) in what he calls his Onesler pose! He has been singing the song “how bad can it be” for weeks! 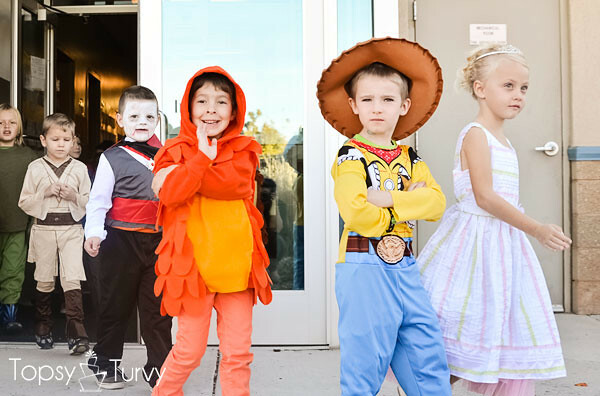 I created a list of a dozen options for costumes from the movie and let the kids pick what they wanted. The DA jumped on the Humming Fish… I wasn’t sure how to even begin! 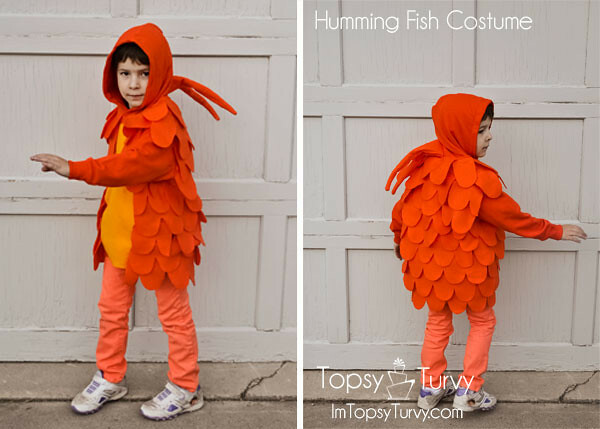 I bought an extra large orange sweatshirt, adding felt stomach, and felt fins. Everyone of the kids kept bringing up the back fins. Coming up with them was hard, but I think it turned out okay! I dyed some jeans orange! and we’re done! The Computer Boy didn’t want to dress up this year, so he was the hold out on most of the themes. So this Onesler outfit from the beginning of the movie that is almost a normal outfit was easy! I bought some black jeans, taped off some stripes and then sprayed on some watered down bleach to create the faded lines! Add a white long sleeve shirt, a black vest and a grey hat and your done! He’s showing off his dance shoes here! 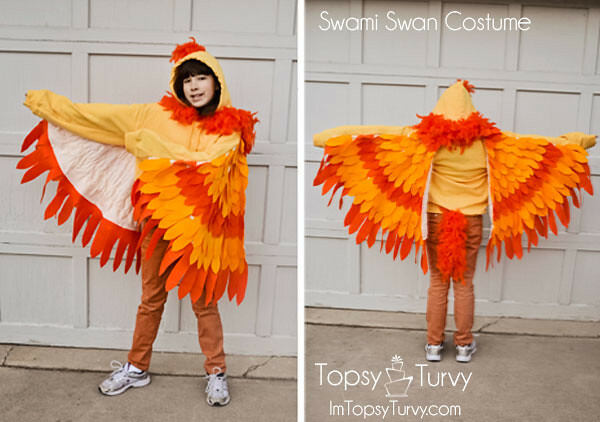 And The Reader, picked the hardest one, a Swami Swan! How in the WORLD do you create such a strange shaped Seussical outfit??? I looked up bird costumes and found the idea for the wings. I used felt for the feathers, and sewed them onto fabric quarter circles. Then sewed the “wings” straight onto a yellow sweatshirt. Adding peices of an orange boa for the feather on the top, the tail and around the neck… Dyed some khaki’s orange and done! By far the most time consuming, but she seemed really happy with it! And the whole family again! They weren’t allowed make up at school, but we’re planning on doing the girls faces for tonight, hoping adding large eyes will help the fish and birds look more Seussical! The non-greedy Onesler, look at that SWAGGER!!! Such a handsome boy! And finally my little Lorax!!! 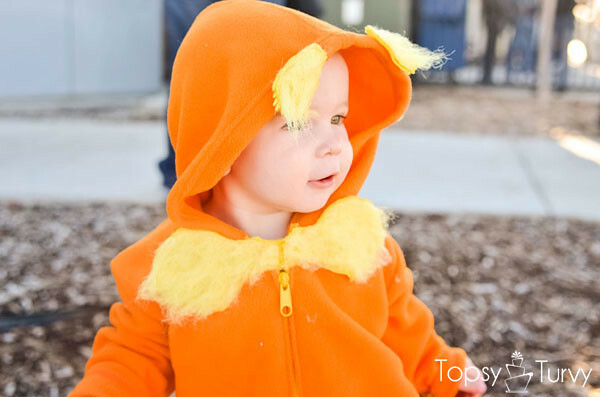 He loved the costume parade, but for some reason one person thought he was a walrus, and 3 people thought he was a pumpkin… Seriously a sweet handsome happy boy, I sure love him bunches and bunches, even if he won’t wear his mustache! Love Love LOVE! They are so cute! Love the theme! Thanks!!! Finally getting around to catching up on blog comments! SO fun! Your little family is awesome! Thank you so much! I love doing family themes, my husband says the oldest will be too old next year, so I’m pretty bummed! Love this! Wow! So much fun. Thanks so much! It was a ball putting it together! ok… seriously too cute!! I might be asking you for advice on making a jacket like that in the future… Dax wants to be the mad hatter next year, and I think a coat like that would be too perfect! I can’t believe you made it!! it was super easy. I just bought a suit pattern from Joann’s but instead of cutting it short I added a few feet, then once it was finished i shaped the bottom! Everyone looks fabulous. I am new to your blog and loving all of your crochet work. I live crocheting. I’ve posted my recent projects on my blog. They are so much fun. I’m so glad you found my blog! now that it’s getting colder it’s time to start crocheting again! I’m excited for a few new patterns I’m working on! Seusstastic! You are a girl after my own heart! 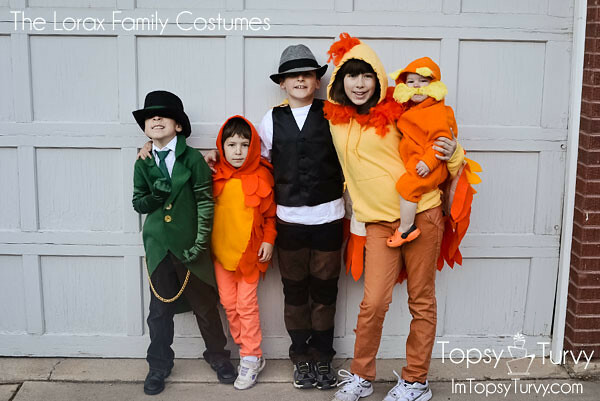 This is a great group/family costume. You did so much work for these. 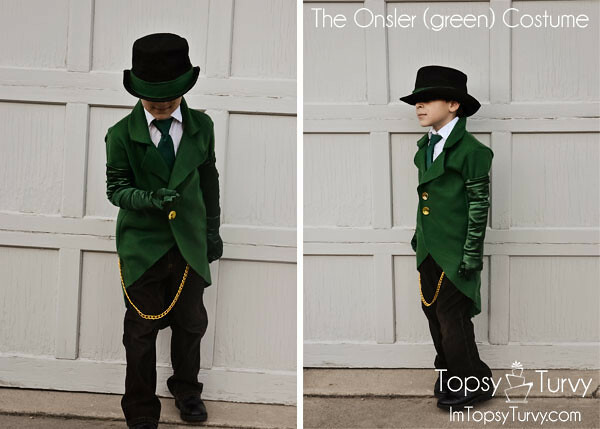 The green suit for the Once-ler is amazing! 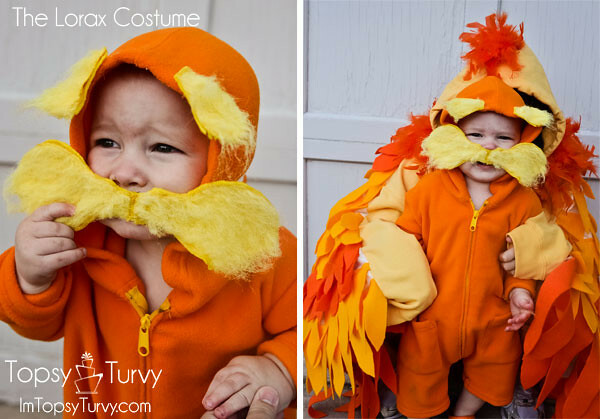 and your little Lorax is adorable. Pinning and sharing it. Thank sweetie! It was a blast! 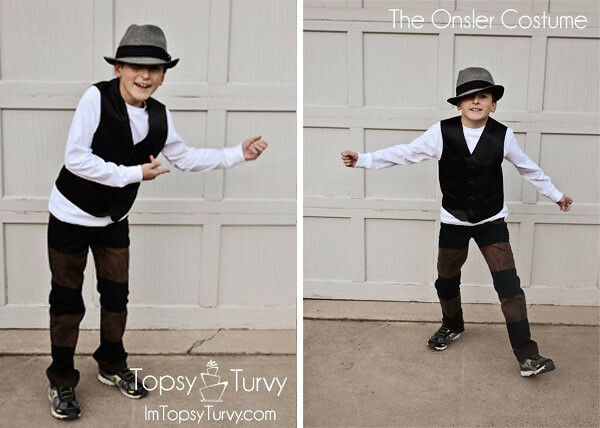 the Green onceler wasn’t too bad, it was that darn bird, all those feathers, that took the most time… and in the end people at school called her a chicken all day and she came home in tears! Boo! Your mom ninja skills know no bounds. You are amazing! HA! Thanks! And we have GOT to get together for lunch soon! Maybe next Friday? awww thanks! I made them all in just a few days, so they were a bit rushed, but I loved the way they turned out! I wish I had gotten pictures of all the steps, but I was going so fast I didn’t stop and take the time. How did you make the green jacket? I actually bought a boys suit jacket pattern at Joann’s and instead of cutting it straight I added a few feet to the pattern length then trimmed it in the curve once he tried it on. Since it was just for halloween I just used felt and didn’t bother with lining. I’m so sorry I’m playing catch up, I just got a jacket pattern from joann’s and lengthened the back! I’m so sorry!